"Back in February Apple released new MacBooks and MacBook Pros which means the previous Mac Performance chart is out of date. Time for an update! "Results were collected from the Geekbench Result Browser for Macs with standard processors (i.e., no processor upgrades, overclocked processors, or Hackintoshes) with at least 512 MB of RAM running Leopard." "In the wake of a widely publicized security breach that left thousands of patient records exposed, the federal government's National Institutes of Health is forbidding all employees who use Apple's MacBook laptops from handling sensitive data as of Friday, InformationWeek has learned. "Employees at the health agency who store medical records and other personal information on laptops must use systems that run either on Microsoft's Windows operating system or Linux, according to an agency memo. "Those systems must be equipped with Check Point Software's Pointsec encryption tool as of April 4, according to an NIH mandate. Systems running Windows Vista can also use Vista's built-in BitLocker disk encryption tool. "NIH imposed the no-MacBooks rule because there is no Apple-compatible version of Pointsec. To date, Check Point has only released a beta version of Pointsec for Macs that's not yet ready for government use." "Your MacBook Air display has no picture after you turn it on. "It's been almost two months now, and life is still almost perfect living and working with the MacBook Air. To recap, for those of you just joining us, in previous articles I told you my reasons for ordering a MacBook Air. Then, after having it for a few days, posted a fairly well-regarded review of the new Mac. "Now, after a bit of time has gone by and I've had a chance to use the MBA on a daily basis, it's time for an update on my experiences, both good and bad...."
"I've been a diehard advocate of 17-inch laptops ever since Apple produced its first model, a PowerBook G4 variant. I'm a big guy, and it's the only laptop I use that doesn't feel like a toy in my hands. Unfortunately, 17-inch models also tend to be pretty power-hungry, so I'm always looking for additional juice. Enter FastMac's TruePower 17-inch MacBook Pro battery. It offers looks and runtime similar to Apple's own battery, but it's priced $30 less." PR: Toshiba's Digital Products Division (DPD), a division of Toshiba America Information Systems, Inc., today announced that its newly designed Satellite laptops are equipped with innovative Sleep-and-Charge USB ports, which make it possible to charge and power electronic devices no matter if the laptop is powered-on, off, or in sleep mode. "Toshiba has long been a leader of innovation, and prides itself on creating solutions that make the digital lifestyle even better," said Jeff Barney, vice president of marketing, Digital Products Division, Toshiba America Information Systems, Inc. "With the development of the Sleep-and-Charge USB ports, Toshiba has developed an innovative technology that helps ensure that our digital products are ready for use at the moment we need them." 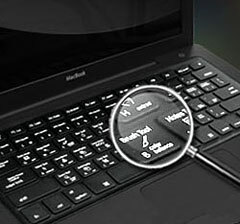 A common shortcoming among today's laptops is that USB ports are only powered while the computer is on or in use. Once the laptop is turned off or placed in sleep mode, the powered ports become dormant, leaving devices such as MP3 players, mobile phones, digital cameras, or PDAs without a full battery charge. Toshiba's innovative Sleep-and-Charge technology eliminates this problem by allowing users to charge and power their devices simultaneously via USB in a variety of power settings. While off or in sleep mode, as long as the laptop is plugged into an outlet, users are able to charge their devices at any time. "Having launched the first batch of 45nm Atom-brand processors yesterday, Intel today began touting the next set, these ones aimed at sub-laptops and small form-factor desktops rather than Mobile Internet Devices (MIDs). "Codename watchers will be wondering where 'Diamondville' fits into Intel's Atom family, and now we know for sure. It's the part that will become the Atom N series, leaving the Atom Z series - aka 'Silverthorne' - for MIDs. "Diamondville and Silverthorne are based on the same microarchitecture, developed from the ground up under the Silverthorne codename since that was the first chip of the family to be developed. Both versions are fully compatible with the 'Merom' Core 2 Duo, so they're limited to SSE 3 rather than SSE 4, part of the 'Penryn' Core 2s." PR: Developer of high quality accessory products for Macintosh, iPod, and iPhone, Gadget Wrap, today announced its debut along with its first product offerings, the Gadget Wrap KeySkin Keyboard Protector series for Apple wired and wireless keyboards, as well as MacBook keyboards. Each Gadget Wrap KeySkin Keyboard Protector is made from super thin, high quality, durable silicone to ensure it provides keyboards with exceptional protection and a tailor-made fit. 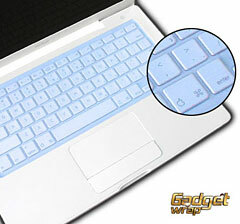 Available in a variety of colors, the Gadget Wrap KeySkin Keyboard Protectors help guard and protect against liquid spills, food crumbs, dirt and dust, and other contaminates that can easily damage or destroy a keyboard. What's more, Gadget Wrap KeySkin Keyboard Protectors even help extend keyboard life by reducing normal day-to-day wear and tear. Gadget Wrap also announced MacBook KeySkin Pro for Adobe Photoshop. The MacBook KeySkin Pro Keyboard Protectors provide the same exceptional protection as Gadget Wrap KeySkin Keyboard Protectors, but also includes keyboard shortcuts for Adobe Photoshop printed directly on the protector. 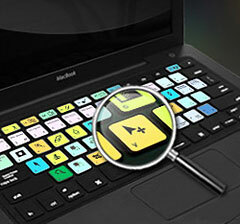 Providing the best of both worlds, not only is the user's keyboard protected, but no longer do they have to memorize or look up various Photoshop keyboard commands, making work much more efficient and productive. "We're very excited to be bringing these new product lines to Macintosh customers everywhere, and we're looking forward to following up with equally great products for the iPod and iPhone markets," said Gadget Wrap president, Charleen Becchina. "We've worked really hard to provide super top quality products at superb price points that handily beat our competitors." Gadget Wrap, Inc. will soon be releasing its own line of high quality products for Apple's wildly popular iPod and iPhone series of products. For complete information on Gadget Wrap, Inc. and its products, visit their website. 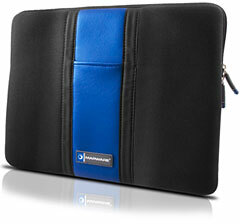 PR: Marware has introduced the Sportfolio Sleeve and Sportfolio Vertical Sleeve cases for the MacBook Air. The Sportfolio Sleeve serves as two cases in one: as an ultra-slim carrying case or as an extra layer of protection in a bag or backpack. 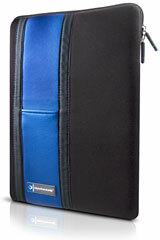 Constructed of rugged neoprene, the sleek design allows for easy notebook storage and retrieval. The Orca-skin front pocket conveniently stores objects while the plush interior and lined zipper deliver multi-layered protection. The Sportfolio Sleeve features an easy-grip edge for carrying as a folio. The Sportfolio Vertical Sleeve serves as two cases in one: as an ultra-slim carrying case or as an extra layer of protection in a bag or backpack. Constructed of rugged neoprene, the sleek vertical design allows for easy notebook storage and retrieval. The Orca-skin front pocket conveniently stores objects while the plush interior and lined zipper deliver multi-layered protection. The Sportfolio Vertical Sleeve features an easy-grip edge for carrying as a folio. Each model comes with an Apple one-year warranty, and ground shipping is free. Changes this week are the addition of a 2.6 Ghz 17" MacBook Pro with high-res dislpay and a 2.2 GHz Black MacBook.